IT recruitment firm Mason Frank recently conducted a global Salesforce survey, gathering opinions from Salesforce professionals. Topics included current salaries, further earning potential, development opportunities, benefits, and overall job satisfaction. Responses came from professionals in a number Salesforce roles—from admins and project managers to functional consultants, technical consultants, and architects. 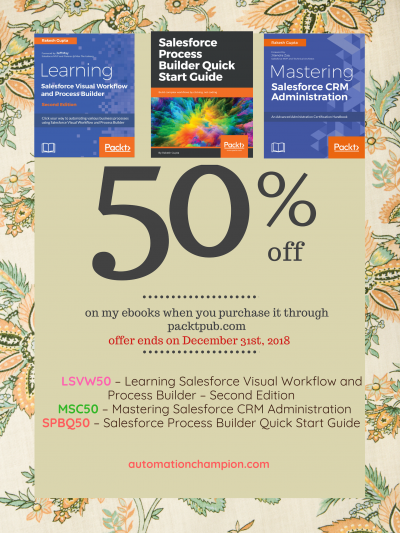 Automation Champion was noted as a key resource for Salesforce professionals looking to gain industry knowledge and insights, too! Only 30% of respondents believe that a degree is important for a career in Salesforce, but the majority believe that additional experience would help them to increase their earning potential. For some, this is experience via courses and credentials, for others, it’s having spent time working with a broad range of business functions, and for the rest, it’s about more years in the industry. Diversity and inclusion is a hot topic and is an area in which the tech industry is often perceived to be lacking. Despite this, 73% of respondents said they believe their company is gender-balanced, and 76% said that it is culturally diverse. However, only 41% said that their company workforce included workers with a disability. The benefits and perks of a job are increasingly becoming deal-breakers for employees when it comes to accepting a job offer— particularly for millennials. Companies offering treats that will genuinely appeal to people and increase happiness at work are more likely to retain employees. The most sought-after benefits for respondents were health insurance and remote working. Almost one in every five respondents (18%) stated they felt undervalued at work—of those respondents, 20% said this was down to employers not appreciating or understanding the value of their technical expertise. This is a dangerous position for employers to put professionals in; in today’s market, employees are not afraid to up sticks and leave if they feel overworked, underappreciated, or simply unfulfilled. Furthermore, only 64% of respondents plan to be with the same company in 12 months’ time. The main reasons for people wanting to change jobs within the next year were lack of salary increase (62%), lack of career prospects (57% ) and the need for new challenges (53%). Lack of added benefits and remote working were also popular reasons to look for a new role, showing that businesses that fail to embrace truly valuable perks and new ways of working are in legitimate danger of losing out on the best talent. Along with a rejection of unsatisfactory benefits and working conditions, Salesforce professionals also seem to be more open to relocation in today’s market. Overall, 54% of global survey respondents said they would consider relocating to another country or city for work. Top reasons to relocate were for financial gain, career growth, and to be with family/friends. The US was the most popular destination for relocation; for American Salesforce pros, the UK, Canada, and Germany ranked as the most desirable places to move to. Interested in learning more? Download the full salary survey for a more detailed breakdown. Note: – I am grateful to Resco.net, Smartcloud.io, Cirrus Insight and Skyvva for sponsoring my blog. ← Want to turn your life around for the better? Try gratitude – it will change your life!